Baby Girl is due in August and has Down syndrome. How do we know? Ultrasound markers led us to a blood test = unofficial diagnosis. I have thought long and hard about why we have handled our tests the way we have. And I want to share in hopes of encouraging other parents in similar situations. Yes, we are incredibly pro-life. No, the test results do not change our decision to parent. Still, I wanted to not do two tests and then do one. We (MH, Paul and I) agreed from the start on not doing the early blood test. These tests are infamous for false positives. And I believe they have sent many many babies to their deaths. No, we would not have had an abortion. The three of us were already on track for adoption, no matter the physical issues Baby may or may not have. Plus, it was waaaaay too soon, in my opinion, to be planning for a disability or something. At ten weeks, I just want the baby to live past the thirteen week mark, where the risk of miscarriage lessens. And I think added stress in the first trimester is just not a great idea. Though these screening tests are often done at weeks ten to thirteen, they are still seriously “off” in producing false positives. Lastly, information that is mostly likely undependable is useless, really. So, no to the first test. Then, at twenty-two weeks, we had our ultrasound. As I had believed, we saw signs (officially called “markers”) of Down syndrome. This sent us to the geneticist, who practically pushed for the amniocentesis. We said no. Adamantly. 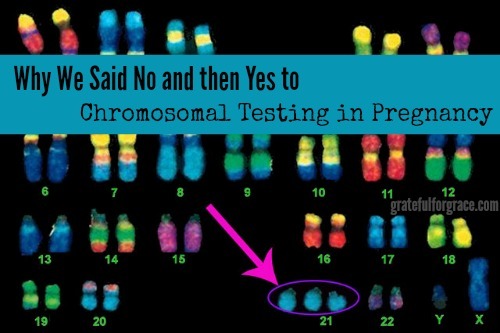 The risk of miscarriage is there and since the test only diagnosed, changing nothing for Baby, we said no. Several times. Maybe, just maybe, if an amniocentesis diagnosed something that would then lead to some kind of help for Baby, we might do it. It would have to be a solid yes in providing some kind of physical help to her for us to risk miscarriage. At twenty-two weeks in utero there is nothing that can be done to “help” baby as far as complications of any kind any way, and none for DS, so it was a no brainer for us. Though the geneticist didn’t seem thrilled. Whatever. Why then did we say yes to the blood test offered to us at week twenty-two? 1. The test, cell-free non-invasive test, is highly accurate and the risk of false positives is very very low. It is still technically only a screening and not a diagnosis. Diagnosis can be officially made only by taking the baby’s cells directly. The fact that the research shows this test to be extremely accurate was reassuring, either way. 2. The test is done with maternal blood only. This means there are no risks to Baby as well as none to the mother. 3. We could emotionally prepare and process. This birth is not going to be “normal”. Nothing about it will be so. One woman will be placing her baby in the arms of a friend, to be the baby’s mother, placing into a family. One woman will be accepting a child from a long time friend and becoming a mother to a child not born to her, for the first time. The two women will be together in the hospital and will live together for a bit post partum. Nope. Not normal. I decided in my head that any “unknowns” we could take off the table before such an emotional time would be a good idea. Some people really do like preparing as much as possible. No, you can’t know for sure the complications or whatever that a diagnosed baby in the womb will have after birth, when it comes to Down syndrome. But list checkers and those who like to plan ahead, yes, like me, find comfort in doing a bit of research, joining support groups, and learning about some challenges in advance. For example, we don’t have a crib yet. I was starting to wonder about that when I babysat a seven month old baby boy with DS for three days (yes, overnight). His reflux, which is common in babies with DS, is so severe he sleeps in a special little bassinet that is tilted up. He doesn’t even use a crib yet. So, I chilled out on the crib gig. We may not need one for quite awhile and that’s an expense we can delay until we know Baby Girl’s specifics. I like preparing in that way. It’s proactive. I like proactive. Plus, again, we are already processing and dealing with a lot here in our home, having the birth mother live with us and will have even more at delivery, so taking any known surprises off the table for delivery day helps. All of us. 4. Knowing could keep Baby Girl alive. A reason I would now add in favor of the later prenatal test is that knowing your baby has Down syndrome may help the baby survive. While this is not true if a woman is proabortion and finds out early in pregnancy she may have a child with Down syndrome, it very well could be the case for a prolife woman or a woman who is fine with parenting a child disabilities, proabortion or prolife. How? We have learned that babies with chromosomal anomolies are at high risk for still birth due to placental insufficiency. This means we will start having weekly visits/ultrasounds beginning at week thirty-two. They will check for continued growth, weight, and placenta “flow” (my word for the movement of the blood through the umbilical cord). Measurements are “accurate” only every three weeks, so one week we will take measurments the next a fetal stress test, and the next biophysical profile. If these show concerns, then an emergency c-section to save the baby will occur, without delay. I’m glad I know this, though it’s tough to fight the anxiety. If we didn’t, we would go monthly to the doctor like any other pregnancy and no more ultrasounds to check weight and such. The placenta could stop “feeding” the baby well and we wouldn’t know. And it could cost Baby Girl her life. I’m grateful that we will be checking and will intervene if necessary. So…. those are my reasons. I’m grateful for the 99% confirmation of what I have believed for most of the time, but I know that not until we see Baby Girl, her blood is tested, her heart is checked, and all of that…. will there be an official diagnosis. And that’s ok too. Our situation isn’t typical, but I’m willing to bet that these reasons for doing the more accurate test may resonate with other women. Baby Girl is going to rock her extra chromosome. And I’m going to learn how to rock being the mama of a daughter with one. Do these reasons resonate with you?